The captions read "Cold Peened" for the sword on the left and "Hot Peened" for the one on the right. The image above also implies that cold peened swords aren't full tang. "Another compression method is a peened assembly, but one where the peen is the method of holding the assembly together. These generally have to be cold peened, because the grip is added before the pommel is put into place. Applying heat in the peening process under this method would scorch or even burn the grip. 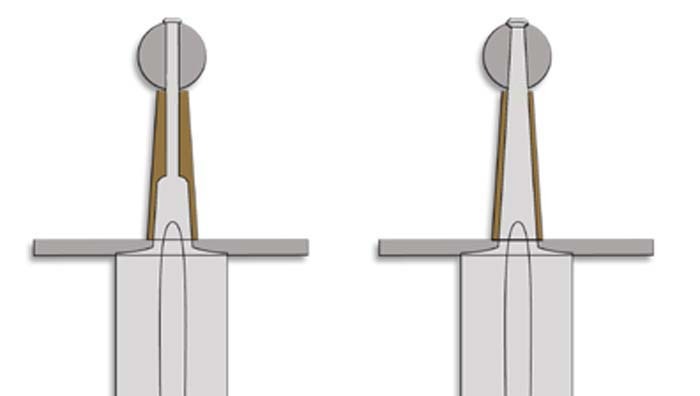 To facilitate cold peening, a round mild steel bar is often welded onto the end of the tang (sometimes comprising the majority of the tang) so that it passes through a hole (often round) in the pommel. Mild steel is softer and more malleable, and thus can be peened by hand without using heat. " I understand that most people look at pictures and don't read the text, but I thought that the context is clear on which type of cold peening we were discussing and why they may not have full tangs. When this article was written, about 2 years ago, the purpose was to compare the different assembly methods in "production" swords and explain why we had shifted to wedged/hot peened (in the text it does say that the parts are permanently wedged into place and then hot peened.) The other large makers that cold peened swords then did weld mild steel on to the tang. So, out of context, the image may seem misleading, but the text is quite clear. I'd like to add that what is often overlooked in this kind of thing is that there are a myriad of ways things can, and have, been done, with each method having pros and cons, each method having situations that can often guide the choices of methods used... I think what is critically important throughout is that whatever method chosen is one that's done well. Skill of the craftsman, the practice involved in the method, the approach and care taken, really seem to me to be in the end the most important factors determining the quality of the end product. Personally I've tended towards building grips off of the sword and mounting the hilt all at once, but the guard and pommels are still wedged into place, the end result is not so different from building the grip after the fittings are in place... however, it is certainly a different approach and requires that quite a few things have to be considered beforehand, with regards to how everything is going to fit together. In that case I cold-peen the tang ends, but this too, has it's own set of requirements that have to be considered to ensure things are properly seated and strong in the end product. After meeting Peter and seeing his preferred method in person I've worked with that more as of late, and I like it too, and it has many merits, and will use it in the future.... but I'll still do it the other way as well. Mainly, they are just different methods, with different paramaters that need to be adressed to make everything "right" in the end. I found quickly the main issue is always that whatever method is used, it's just gotta be done well. Hot peen, cold-peen, threaded, nuts, grip before, grip after, it all can be done well, it all can be done not-so-well. Just like forging or grinding, just like heat-treating. Its been a great thread,I will be revising some of my earlier opinions as a direct result,as well as having made the acquaintance of some good people along the way. I will always forge my blades however,despite the various contentuous issues around the viability of forged over ground, there is something absolutely engrossing about working a blade through the fire,and although it may be seen as Marketing i genuinely believe that the Will of the Smith manifests itself through the hot steel,and that attention is its own reward. Dayum, sure learning a lot here! Learning a whole lot about how much I do not know.